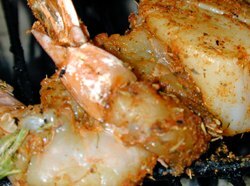 I used the Creole seasoning from Emeril’s New New Orleans Cooking, but any mild or spicy season-all will work here. Grilling the shellfish skewered on rosemary branches imparts the herb’s distinct flavor to the flesh. Choose older, woody rosemary stems. Tender green stems won’t hold up as well. It’s best to find someone with a rosemary bush they’ll be happy for you to prune it, and you’ll get longer, woodier stems. 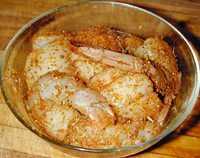 Toss shrimp and scallops with seasoning. Set aside. 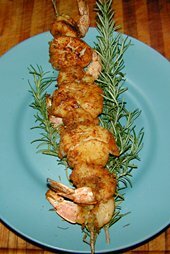 Thread shrimp and scallops alternately on rosemary branch. Grill skewers over medium coals for 3 – 5 minutes. Turn skewers and grill until shellfish turns opaque. Serve on skewers, garnished with additional rosemary. This entry was posted on Thursday, September 6th, 2007 at 10:04 am	and is filed under Appetizers, Carnivore, Main Dishes, Master Recipe Index, Speed Queen (30 min/less). You can follow any responses to this entry through the RSS 2.0 feed. You can leave a response, or trackback from your own site.